This year I’m helping you take the craaazy out of Christmas with some super cool Christmas gift ideas for hard to buy for peeps. Boy, girl, dog, cat. You name it. I’ve got you covered. And the good news? There’s nothing over a hundy and definitely no camel milk delivery service (delightfully ridiculous, but no thanks Gwenyth). So. Bra off. Hair up. Sweats on. You and me. We’re going shopping. Got a girlfriend that loves a cuppa? Help them sip their way through summer with a T2 Tropic Chiller. It comes with everything you need to make delicious iced tea, including a 1.2 litre jug and 2 awesome loose-leaf teas. All boxed up and ready to go for $50. 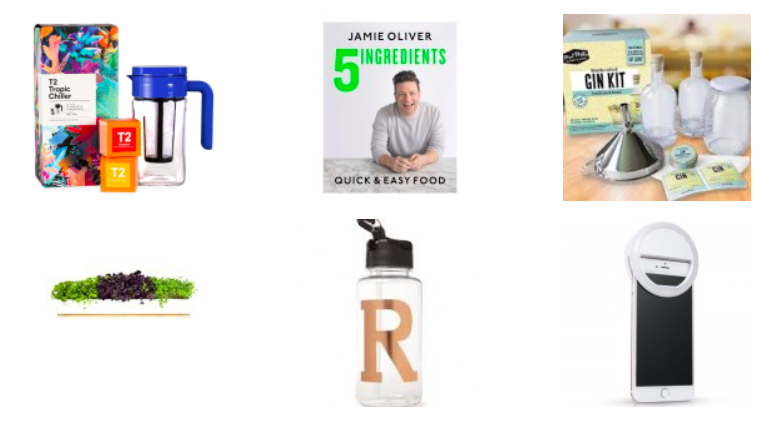 The world is going mad for Jamie Oliver’s newest book. Why? Because seriously insane how much yum you can cook with 5 ingredients. It’s the cook book that every busy peep needs this Christmas. Get it online now at Dymocks. Forget turning water into wine. You can turn vodka into gin. Seriously! The Mad Millie Gin Making Kitincludes all the stuff you’ll need to make your very own infused gin out of vodka, including funnels, strainers, glass jars and super cute labels. Get on it guys. 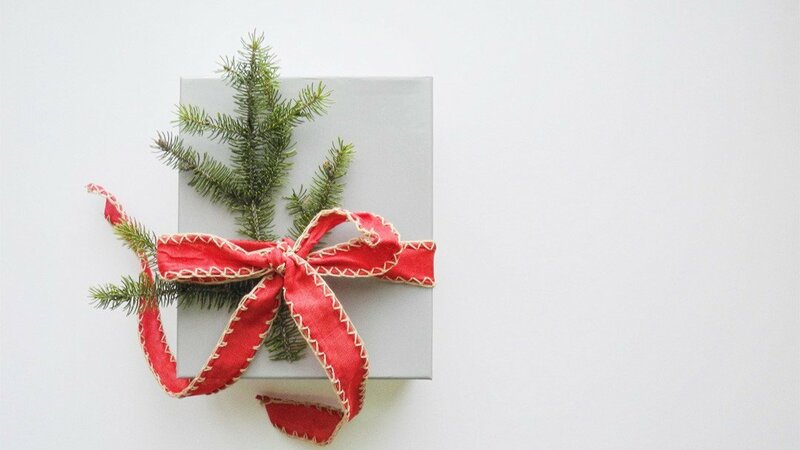 These boozy gifts are selling out fast. Urban Greens Kits include everything you need to grow micro greens right on your window sill. The perfect Christmas gift for would be green thumbs and foodies. The kits are $49.95. Grab one over at the Kitchen Warehouse. Drink more water and look cute trying. These Alpha Drink bottles are totally cool. And at $13 bucks a pop, are an awesome Kris Kringle gift or stocking filler. Selfie rings are life. Clip one on your phone and suddenly you look awesome in low light. And since, teenage girls love selfies more than Kanye loves Kanye. BOOM! It’s the perfect Christmas gift for teens. And hurry, they are on sale now for $15 at Gadgets 4 Geeks. P.S – I won’t judge if you put one in the cart for yourself. Promise. OK, Google what do you get someone who has everything? The Google Home is the hottest Christmas gift of 2017. Imagine having your very own home assistant to wake you up, tell you where you need to be and answer all your burning questions (OK Google, is Kylie Jenner really preggers?) And at $79,95, the Google Home Mini is the actual perfect Christmas pressie, for any gadget loving bloke. I am not even kidding. There is research that shows men in the UK own more shoes than women. Turns out guys are O.B.sessed with sneakers. So why not feed the sneaker beast, with a super cool sneaker cleaning kit for Christmas. Killer kicks guaranteed. This Minispresso Machine is the actual best. I’m talking a portable handheld espresso machine. Real coffee anywhere…anytime. Plus, it’s compatible with Nespresso capsules. Officially the ultimate gift for anyone who’s in a committed relationship to coffee. When the man in your life constantly nicks your nail scissors. Solve the problem (and reduce the risk of fungal infection) by treating him to his very own gentlemen’s manicure kit. They’re designed in England so proper fancy. And at $39.95 they are the perfectly priced pressie for the man that you love. Grab one over at Yellow Octopus. 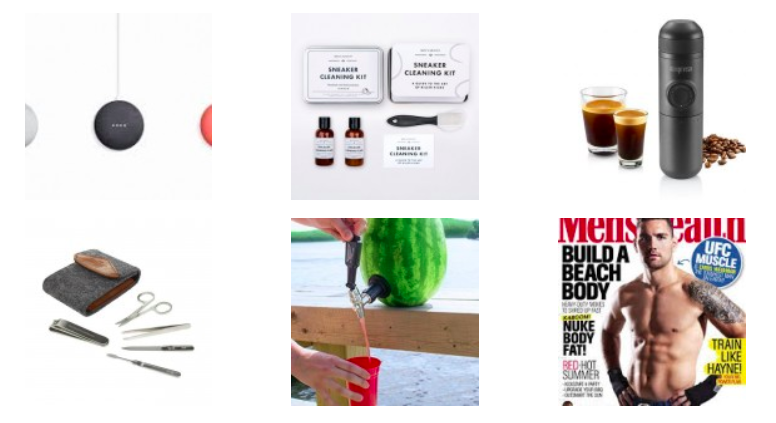 The man who has everything…does not have a watermelon keg tapping kit. But, he absolutely needs one. Cos, a BBQ with a watermelon keg…so much freaking fun. Check them out at the Dad Shop. With hundreds of different titles to choose from there’s a magazine for everyone. Yes, even those super tricky teenage boys. And you don’t have to spend a fortune. I’m talking 4 issues of Inside Cricket magazine delivered to his door for just $29. Check out isubscribe for all your options. There is nothing more certain in life than death, taxes and that kids think farts are hysterical. Crack a little one up this Christmas with a Farts in the Wild Book It’s part book, part fart machine and it is H.A.L.A.R.O.U.S. They’re letting it rip for $20, on sale over at the Book Depositary. Trunkie ride on suit cases are the actual best. Why? Part toy (ride on dinosaur, anyone?). Part practical totally parent approved gift. Serious high fives all round if you put a Trunkie under the tree. 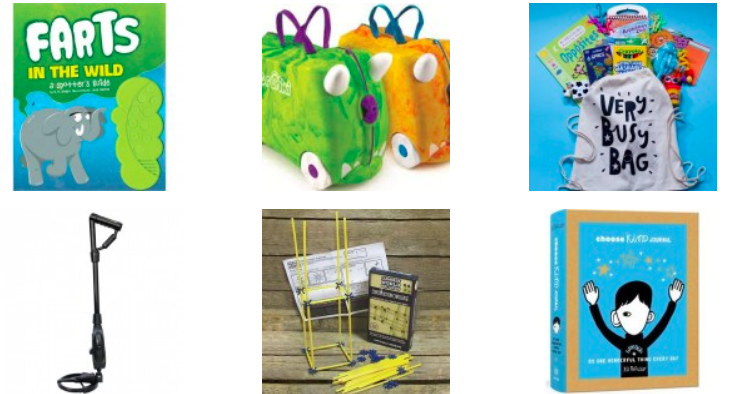 The Very Busy Bag is naturally the most awesome kids present, because a) loaded with 10 cool toys b) super cute take anywhere calico bag c) it will keep the kids busy so you can get stuff done. Plus, bonus points for being made by a lovely Australian Mum. You can check them out here. Buy a kid a metal detector. And just like that. You are the coolest person in the world. Get one that is especially designed for kids at Australian Geographic. And make sure you negotiate your clip of the buried treasure – it could be the best $40 you ever spent. Guiness World Records has created a Construction Challenge Kit giving you the chance to break not one, but two real life World Records. It’s a gift that big kids and little kids will totally love. Cos, break a Guiness World Record. Legit life goals. If you are looking for something super special for the little ones in your life a Choose Wonder Journal is the perfect gift. Filled with quotes and questions, it helps kids think about how they can be kind every day to other people and themselves. It’s kind of amazing really. You can pick up a Choose Wonder journal from Biome for $22. Seriously. Look no further than Kmart. 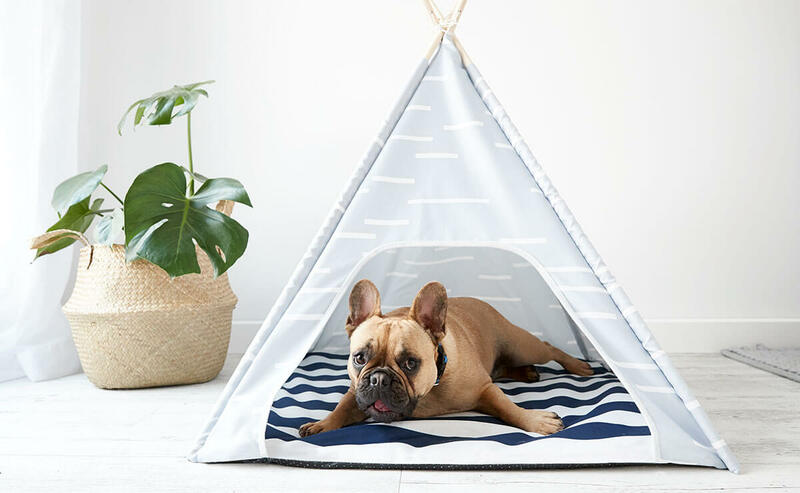 From pet teepees (it’s a thing and it’s saaah cute!) to super cute costumes and toys. Kmart has everything your furry friend could ever want this Christmas. You can check out the full range here. P.S – Some of the links in this post are affiliate links, which means I earn a small commission if you click through and buy something. Thank you for supporting YTGT.